1. What is a negative number? 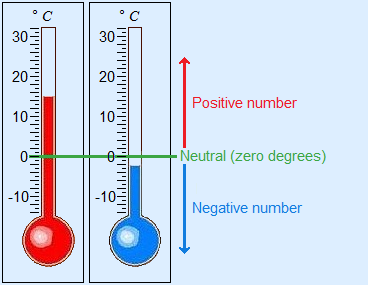 Negative numbers are used for example with temperatures. Below 0 °C it will start freezing and we use –1 °C, –2 °C, et cetera. The number 0 is neither positive nor negative, but neutral. In Belgium and France however, this is not the case. They find zero and positive and negative. Numbers above zero, they call 'purely' positive and numbers below zero 'purely' negative. Positive and negative numbers are each others opposite. The opposite of 3 is –3. The opposite of –7 is 7. On the number line the negative numbers are to the left of zero. –5 is less than 4, because –5 lies to the left of 4 on the number line. –1 is greater than –3, because –1 lies to the right of –3 on the number line. For less than you can use the <-sign. For greater than you can use the >-sign. 1. The direction of < and > always points towards the smallest number. 2. The < and > sign bites towards the biggest number. 3. You can change < into a K of "kleiner dan" (for Dutch students). Do you really find this difficult? With + you will go towards the right on the number line. With – you go towards the left on the number line. You can try to do the examples above with a number line.